I'm sure most Malaysian may have heard of this, especially during Ramadan fasting month, some mosques will be giving out free Bubur Lambuk. 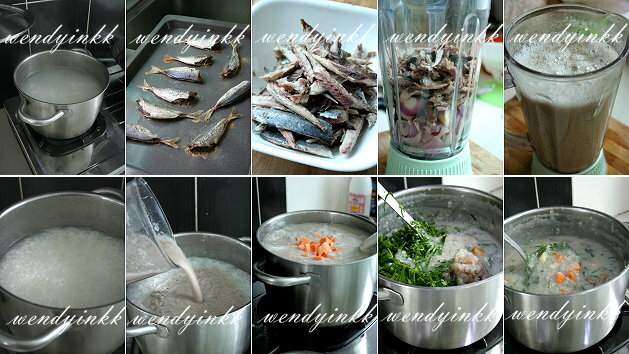 Unlike the west coast version, the ingredients used in Terengganu is very different. It uses fish, sweet potato and lots of local wild vegetables. I was curious about the taste, so I decided to try it out. 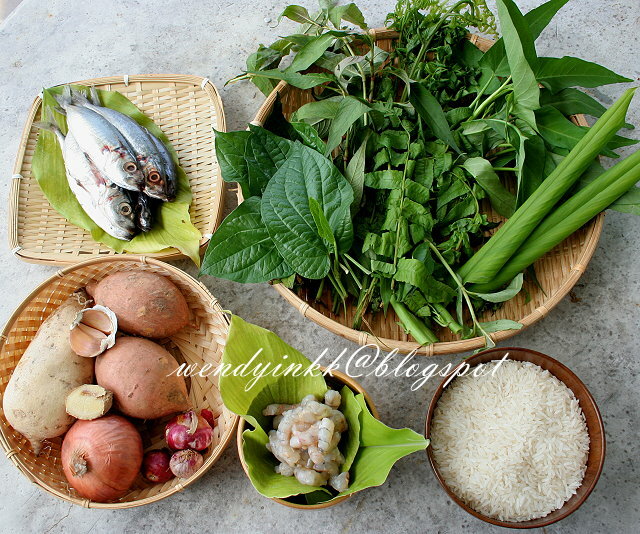 One is free to use any type of vegetables but some do insist on the use of wild pepper, lemon basil (kemangi) and red fern (pucuk midin/paku merah). I have trouble searching for the red fern and I was told it wasn't found in Perak. Then lemon basil was no where to be sold except at the garden center where I have to buy the whole big pot! I just went ahead with whatever I could buy at the market or source from my hubby's employee. 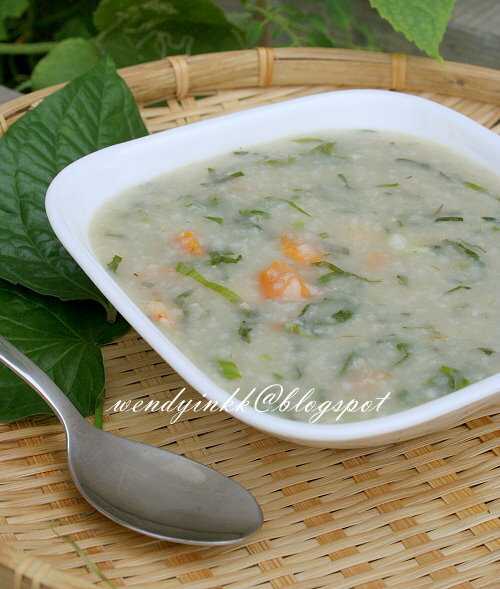 I have eaten some free bubur lambuk (given at TNB KK, when my hubby went to pay bills) before that uses coconut milk, beef, chicken, carrots, spices, fried shallots and chinese parsley. Frankly... I prefer the west coast version. The one I ate previously sounds like this one. Maybe I'm not used to the flavour of Terengganu's version, or maybe I should've just put in coconut milk and I'll like it better. It's just a matter of personal preference. 1. Wash rice and boil together with water. Lower to a simmer. 3. Let fish cool down and remove flesh from bones. Rub fish flesh with fingers to check the presence of bones. 5. Dice sweet potatoes. Finely slice all the leaves and tear off the fronds from the fern. 6. When the rice is all fluffy pour in the blended fish. Let it come back to a boil. 8. Put in all the leaves and prawns. Bring it back to a boil and turn off the heat. Note that after I added the sweet potatoes, it became too full. 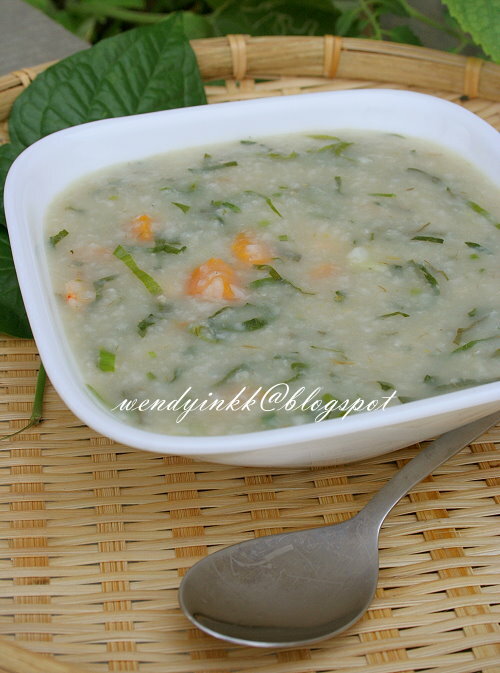 so I removed some porridge to another pot before adding in the vegetables. Oh,I'm sure this is a healty porridge. I love porridge, but not sure about the pepper leaves, doesn't it taste bitter? please let me know,I'm so currious about this. But won't stop me to make it someday. beautiful! recipe, photography and story! I can’t wait to make this! Thank you for your explaination, Wendy. If you said is not bitter, so the taste is totally different with sirih..yaikss..you don't want to try those. Old people used to chew those and help to make their tooth strong. 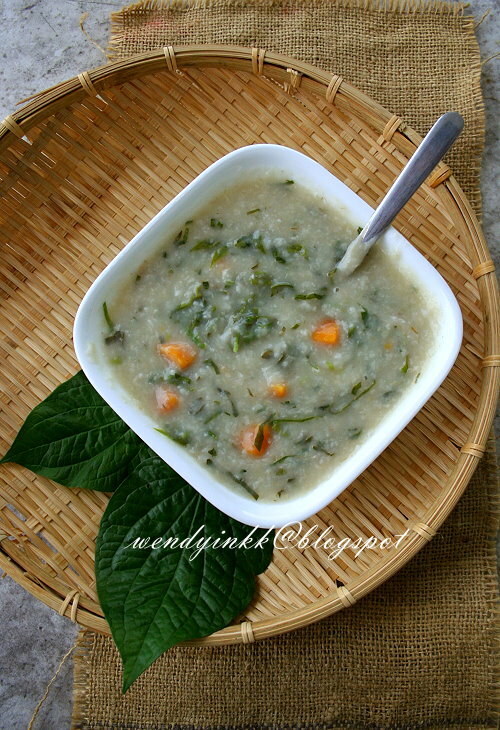 Wendy, you went all out to make this bubur lambuk :) Back home I have only eaten it once. I like the peppery taste. thanks, come join us then! Join the fun! and the teeth looks awfully red! Ewww! yeah, i kinda regretted a bit after that, because i read a few blogs saying it was better without, and even Kak Hanieliza pun tak letak. But then think think, if I added, it will taste like a thick laksam kuah, LOL, that'll be delish! I might be making satar for Kelantan, but still dunno yet, I hate dealing with the tiny bones of the kembung and selayang. if you never send me your entry, i would have forgotten about this dish that you told me earlier. Never had this before, actually there are so many malay deligts and dishes that i've not tried yet. quite a fascinating porridge to me with so many different kinds of ingredients added in!